This programs allows you to easily switch between multiply versions of you profile. 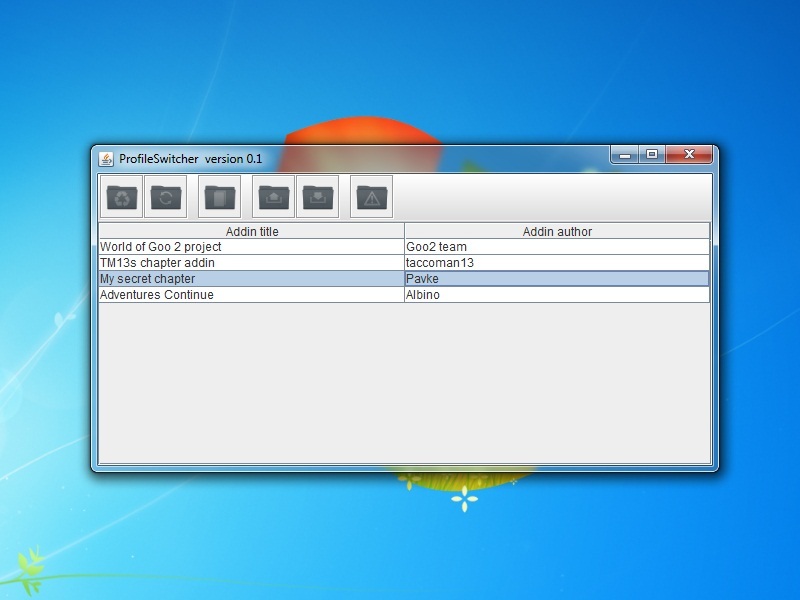 It is intended for players that have "chapter addins" installed or they are in the process of making one. It doesn't edit your profiles and it shouldn't be used that way! Bug reports and especially your requests for future features are REQUIRED! For now, It only works for Vista and Windows 7 users, XP coming soon! Program is completely safe to use but just in case you should make one backup by hand to safe location. I'm not responsible if anything happens to your profile. I don't understand, what do you mean Albino Pokey? Did you use Java, or C++, or something else? Pure Java,nothing more, why do you ask? Heh, exactly. I'd have thought that was obvious. 1.Could you call 'World Of Goo TM13' something like: TM13's View of the World of Goo. If you dont want to, thats fine. 2. 'World of Goo Adventres Continue' has a 'u' in the name. i.e. World of Goo Adventures Continue. other than them, this is an awesome app. Im definitely going to use this program. @TM13: Those were just fillers. Not real mods. This is very useful, I like it. I need this for my very own World of Goo. What OS do you have? Win7, Vista, XP? Then you should click Backup button to save your original profile. After, create a new copy of your profile by clicking Make button. It will show up on the table bellow. Then you go and play your levels for that profile. If you want a new profile, save this first by clicking Save button, and then Make a new one. Table bellow shows your profiles. Help, please... Why I can't to upload .exe and other files? I created new program for WOG, and want to add it. You cannot upload any files except for .goomod, simply so that we don't get spammers hosting whatever they want on here. Email davidc and ask him for permission if you want to upload a non-goomod file (davidc at this domain). Thank you, I'l try to ask him... But I don't understand, what is his EMAIL? This looks like a great program, unfortunately I can't try it out 'cos I'm using XP. You should get round to changing the path as suggested in this thread, I'm sure it'll only take 10 seconds. Oh, and I noticed that the restore button has a typo, "Restores the original progile". But the moderators won't allow it on the site because we already have this program, even though FireGoo came first. Well, in any case, Pavke should add the functionality soon, it's a simple change. And that typo looks horrible, too. @AP: I thought that you all agreed to have this over FireGoo. By all means, if you want FireGoo, we'll publish it. By which I mean someone other than me, or me if I decide for some strange reason to boot to Windows. No, I requested publish on FireGoo but you said it wouldn't work. It's NOT only for .NET programs! If you try typing in an XP path (in Windows Explorer) on Windows 7/Vista, it will automatically redirect you! .NET has nothing to do with it. I would have thought so, since it's Windows that does the redirecting. Well then Pavke, hope you can update this soon, I'm eager to use it.